The powerful thermoelectric unit in a lightweight design is the ideal climate control solution for command panels and small enclosures. Wall-mounted cooling units Blue e+ Total cooling output 2.00 – 6.00 kWA revolution in energy efficiency through innovative hybrid technology. 75% energy saved due to speed-regulated components and heat pipe technology. Unique multi-voltage capability for worldwide use. Intuitive operation via touch display. Identical mounting cut-out (external mounting, partial internal mounting and full internal mounting) for four output categories. TopTherm wall-mounted cooling units, horizontal format Total cooling output 0.30 kW Compact wall-mounted cooling units in horizontal format, output class 300 W, with nano-coated condenser. TopTherm wall-mounted cooling units Total cooling output 0.30 kW Compact wall-mounted cooling units, output category 300 W, with nano-coated condenser. 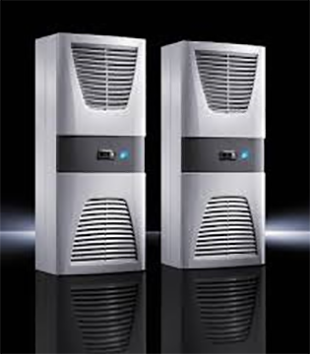 TopTherm wall-mounted cooling units "Blue e" Total cooling output 0.50 – 0.75 kW Energy-efficient Blue e wall-mounted cooling units in output categories from 500 W to 750 W, with integral e-Comfort controller and RiNano coating on the condenser as standard.